MP4 Converter for Mac - MP4 Converter for Mac is specially made for Mac OS X users. can convert video and audio files including AVI, MPEG, VOB, 3GP, MOV, MP4, M4V, WAV, WMA, M4A, AAC, MP3, MP2, 3G2, AC3 to MP4 video and audio formats directly like MP4, AVI, M4A, AAC and MP3. MTS/M2TS Converter for Mac - It can convert MTS/M2TS videos to MP4, MP3, AAC, M4A, WAV file with high quality and fast speed for Mac OS X. It has the powerful function including cropping & trimming videos, adjusting advanced settings, adding watermark and getting thumbnails from playing videos. 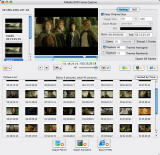 ImTOO Video to Picture for Mac - It is multifunctional Mac picture capture software which helps you extract pictures from various video formats such as MPEG, DivX, Xvid, AVI, RM, MP4, M4V, MOV, WMV and saved as static pictures in JPEG, PNG, GIF, BMP, or exported to GIF and Flash animation. DVD Copy for Mac - It can copy DVD movie with the entire DVD movie in 1:1 ratio perfectly in the cases of copying DVD-5 to DVD-5, DVD-9 to DVD-9, DVD-5 to DVD-9; and compress DVD-9 (dual-layer DVD) to one DVD-5 disc easily. The DVD copying software also allows you copying DVD's main movie only. 3GP Video Converter for Mac is a professional 3GP converter for Mac OS X users. this 3GP Video Converter for Mac can convert all sorts of video formats to 3GP videos that can be played on video cell phones of various bands for 3GP cell phone users. you can download 3GP Video Converter for Mac to have a try now. DRM Converter for Mac is the legal way to convert iTunes DRM protected files to unprotected music files for Mac OS X. DRM Converter for Mac is a DRM copy-protected audio converter for burning DRM protected music to a special CD-RW drive where you get unprotected MP3, AAC, Apple Lossless, AIFF, WAV files! perfect transfer tool among iPod, iPhone and Mac for iPod user like you. This Mac iPod transfer software helps you transfer iPod/iPhone music and video, iPod podcast and TV program to Mac within a few seconds, and vice versa. Moreover it supports file transfer from iPod to iTunes, iPhone to iTunes. All formats compatible with iPod are supported. Video Converter for Mac is powerful versatile video and audio conversion software for Mac OS X users specially. Video Converter for Mac can convert between almost all video and audio formats like MOV, AVI, WMV, MPEG1/2/4, 3GP, ASF, MP4, MP2, MP3, WMA, OGG, AAC, M4A, WAV and AC3 etc. just download Video Converter for Mac to have a try now. iPhone Video Converter for Mac, a faultless iPhone video converter, can convert all popular audio and video files, such as AVI, MPEG, WMV, MP4, VOB, AAC, AC3, MP3, to the formats supported by iPhone/ iPod including MP4, M4A, MP3 etc. It is a powerful Mac iPod video converter which enables you converting all popular audio and video files, such as AVI, MPEG, WMV, MOV, MP4, VOB, AAC, AC3, MP3, to iPod video supported by iPod/iPhone including MP4, M4A(AAC), MP3, MOV, etc. It can convert most of popular video formats to Apple TV Video MP4 formats. The output files can also be applied to Video iPod and new iPod 30GB and 80GB together with the resolution for 640 x 480. With it, you can enjoy the brand-new digital entertainment life with your Apple TV and iPod. It is all-in-one powerful iPhone software for Mac users, including DVD to iPhone Converter for Mac and DVD to iPhone Suite for Mac. It provides versatile settings and features, for example you can rip any preferred segment by setting the start and end time, take a snapshot of the preview file etc. DVD to iPhone converter software for Mac which can convert iPhone video/movie for Mac perfectly, helps you convert movies to iPhone video on Mac, and put movies to iPhone, iPod easily. It provides an easy and fast way to convert AVI to DVD, MPEG to DVD, DivX to DVD, burn DVD folder to DVD, ISO file to DVD for Mac OS to play on portable or home DVD player. It provides an ideal solution to convert all popular audio and video files, such as AVI, MPEG, WMV, MP4, VOB, AAC, AC3, MP3, to the formats supported by iPhone/ iPod including MP4, M4A, MP3 etc. It converts video and audio files, such as AVI, MPEG, WMV, MOV, MP4, VOB, DivX, XviD, AAC, WMA, WAV, AC3, MP3 to iPod, iPhone mobile supported video and audio formats including MP4, M4A, MP3 etc. it can convert video and audio files including AVI, MPEG, VOB, 3GP, MOV, MP4, M4V, WAV, WMA, M4A, AAC, MP3, MP2, 3G2, AC3 to MP4 video and audio formats directly like MP4, AVI, M4A, AAC and MP3. this DVD Cloner for Mac is fast DVD clone software for Mac OS X users to backup DVD9 and DVD5 DVD movie collection to blank DVD discs (DVD9 to DVD9 and DVD5 to DVD5) with ease. It supports DVD 1:1 copy with a DVD burner, the DVD copies remain 100% same as the original DVD movie. it can compress DVD9 (dual-layer DVD) to one DVD5 disc. 4Media DVD to iPod Converter for Mac is smartly Mac DVD to iPod video converter designed to convert DVD to iPod video MP4 used in Video iPod, iPod 30 GB and 80 GB and iPod touch with resolution of 640 by 480. Not only can iPod video be converted from DVD, but also iPod audio formats as MP3 and M4A (AAC) etc. could be converted and possessed from DVD.